Receive an instant price quote from our awesome website by simply entering the brand and model of your laptop (can't figure it out? Click here). 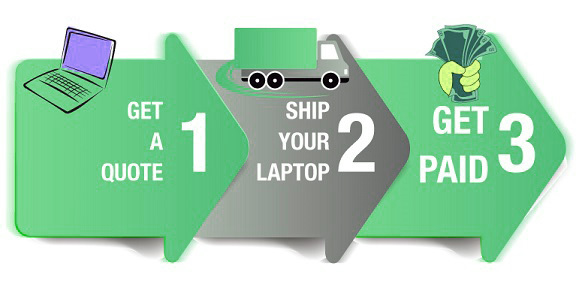 We tell you exactly how much cash you'll receive for your laptop. You'll then receive one of those pesky confirmation e-mails (trust us we don't like sending them but we have to make sure we can get your check to you somehow right?). Double check all of the information and click the confirmation link, or, if something's not looking right just respond and let us know. You'll magically receive a box in the mail, it'll be full of fun stuff like a packing slip, materials to keep your old laptop safe on it's journey to us and possibly a random $50 cash bonus we've thrown in (yes, that actually happens to some of our lucky customers). The instructions are inside and we're confident you'll breeze right through them. Wrap that thing up safely and drop it off at any UPS location. Remember the shipping is free; we pay for shipping both ways, we're just that nice. Now just sit back and relax, we'll take it from here. Once received our highly trained technicians (dorks) inspect your laptop, wipe all of the information from it, confirm it's condition with the description you provided earlier and get your check in the mail. If you prefer to be paid the same day instead of snail mail we happily issue payments via PayPal. You'll get the same payment either way, but who wants to wait?? Most payments are sent within 24 hours of receiving the computer. Keep an eye on your e-mail, we'll be keeping you updated every step of the way. More of a visual learner? We've got you covered!